Residents of Seneca County are still reeling from the flash floods that downed trees, destroyed roadways, and flooded homes. 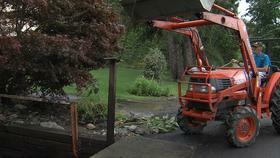 Residents in Seneca County are still recovering from rain and flash floods. Sally Limoncelli lives on Lower Lake Road in Lodi, which runs right along the east coast of Seneca Lake. She and her husband woke up to the sound of rushing water, and before they knew it, there was water in their house. "I mean, it’s water. It’s going to go where it wants to go. We just probably take care of what we can and that’s it. As long as we’re safe, that’s all that matters really." By mid-morning the rain had started to let up, and the Limoncellis were starting to clean up their yard. But down the road, emergency crews were still conducting rescue operations to reach trapped residents in a trailer park. Gov. 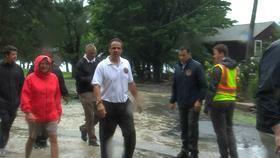 Andrew Cuomo accompanied some of the crews, and called on people to heed evacuation orders. Lodi was among the hardest hit areas in Seneca County. More rain is expected later this week.